Jupon provide a range of bridal bracelets and rings to give the bride that extra special wow factor. Each range is available in a wide range of colours including: white crystal, gold, black, fuchsia, pink, orange, olive and many more. Jupon brings you this lovely bridal bracelet. It's sat on a soft lace base and features a floral design, finished off perfectly with Pearls and Sequins. Available in Multicolour. ..
A beautiful bridal bracelet from Jupon. This piece features a band made of pearls with glass crystal clusters in a floral pattern throughout. Available in Gold. ..
Jupon presents this stylish bridal bracelet. It features a large floral centrepiece with Strass stones, glass crystals, and pearls as focal points. Available in Ivory. ..
A solid Jupon bracelet featuring a floral pattern with pearls and Strass stones throughout the design. Available in Silver. ..
A lightweight Jupon bridal bracelet with a large leaf design and finished off with flowers and pearls. Available in Pink / Blue. ..
A pair of stunning bridal earrings from Jupon. These beautiful bridal earrings feature a cluster of pearls. Available in Silver. ..
An attractive pair of bridal earrings from Jupon. These feature a cluster of shiny pearls and Strass stones on a leaf patterned base. Colours Available: Ivory, Silver, Gold. ..
A Jupon bridal bracelet with a lace netting base and a large flower as the centre piece. This item is finished off wonderfully with a circle of pearls and a stone centre. Available in Ivory. ..
A multipurpose necklace from Jupon that can be worn as both a bracelet and a hairband. This bracelet has a beautiful floral design with Strass stones and small pearls. Available in Pink. ..
Jupon brings you this stunning bracelet with a floral design, and finished off with feathers and Strass stones. Available in Taupe. 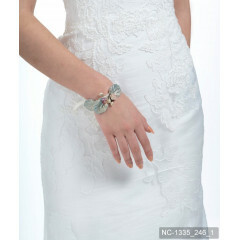 ..
A multipurpose bridal bracelet from Jupon. 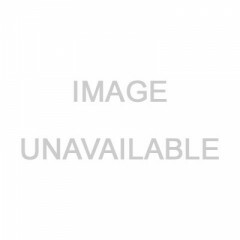 This piece can also be worn as a hairband and looks great as both. It has a floral design with 2 rows of pearls running across the centre. Available in Ivory. ..
A beautiful pearl bridal bracelet from Jupon. This piece features 6 rows of pearls with a large flower design attached. Available in Ivory, and Champagne. ..
A floral style bridal bracelet brought to you by Jupon. A lightweight and comfortable bridal piece. Available in Ivory. 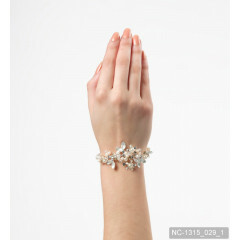 ..
A floral style bridal bracelet from Jupon. This bridal piece is sat on a soft and comfortable lace netting base and is finished off with Pearls and Sequins. Available in Ivory / Pink. ..
A beautiful, large, armband from Jupon. This dazzling piece is covered with Strass stones and both large and small pearls. Available in Ivory. 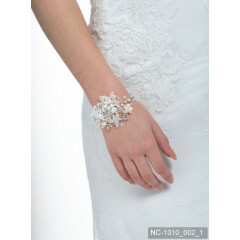 ..
A stylish bridal armband from Jupon with a sparkling look. This piece is covered with Strass stones and various size pearls. ..